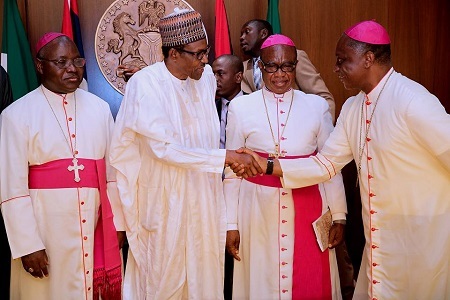 The Catholic Bishops’ Conference of Nigeria on Thursday told President Muhammadu Buhari that the enormous goodwill with which he assumed office in 2015 is being fast depleted by some “glaring failures” of his government. The bishops said this when they paid the President a courtesy visit at the Presidential Villa, Abuja. Their address at the visit, copies of which were made available to journalists, was jointly signed by the CBCN President and Archbishop of Jos, Most Rev. Ignatius Kaigama; and the Secretary who is also the Bishop of Gboko, Most Rev. William Avenya. “There is no doubt that when you came into office, you had an enormous amount of the goodwill of Nigerians, since many saw you as a person of integrity who would be able to bring sanity into a system that was nearly crippled by endemic corruption. “Nearly three years later, however, one has the feeling that this goodwill is being fast depleted by some glaring failures of government, which we have the moral responsibility to bring to your notice, else we would be failing in our duty as spiritual fathers and leaders,” the bishops told Buhari. They regretted that there was too much suffering in the country, with poverty, hunger, insecurity, violence and fear, among others, pervading the land. They said, “Our beloved country appears to be under siege. Many negative forces seem to be keeping a stranglehold on the population, especially the weaker and defenceless ones. “There is a feeling of hopelessness across the country. Our youths are restive and many of them have taken to hard drugs, cultism and other forms of violent crime, while many have become victims of human trafficking. The nation is nervous. “Just as we seem to be gradually emerging from the dark tunnel of an economic recession that caused untold hardship to families and individuals, violent attacks by unscrupulous persons, among whom are terrorists masquerading as herdsmen, have led to a near civil war situation in many parts of the country. “We are saddened that, repeatedly, innocent citizens in different communities across the nation are brutally attacked and their sources of livelihood mindlessly destroyed. The Catholic Bishops said they were still saddened by the recent massacre of unarmed citizens by suspected terrorists in some communities in Benue, Adamawa, Kaduna and Taraba states, which has caused national shock, grief and outcry. They said the Federal Government’s silence in the wake of the attacks was shocking.